PLYMOUTH, Wis., Oct. 10, 2018 /PRNewswire/ — Wisconsin trucking company Service One Transportation will hold its annual driver appreciation lunch and open house this weekend at its Plymouth headquarters. All truckers with a Class A commercial driver’s license (CDL) are welcome to join Service One employees at this family-friendly event for free food, drinks, raffles and more. 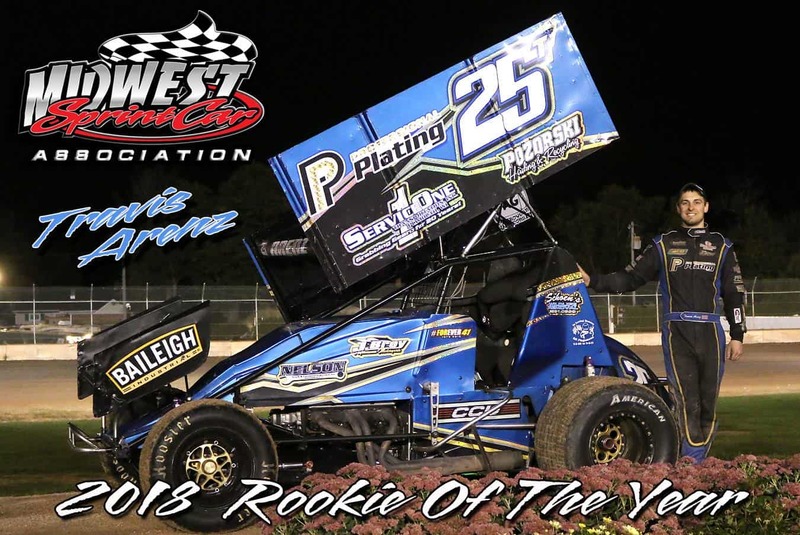 WHEN: Saturday, October 13, 2018, from 11 a.m. to 2 p.m.
Attendees will have an opportunity to check out the company’s newest vehicles as well as its sponsored racecar, which is driven by Service One mechanic and Midwest Sprint Car Association 2018 Rookie of the Year, Travis Arenz. The latest additions to Service One’s modern fleet of Volvo and Kenworth tractor-trailers include four 2019 Kenworth T680 models, which are equipped with a Cummins engine and Eaton 12-speed automatic transmission. CDL drivers, Service One employees and their families will also enjoy a free lunch buffet with beef stroganoff, roasted chicken and assorted beverages, and can enter to win raffle prizes such as Bluetooth speakers, digital tablets, toolkits, CB radios and more. “Our annual driver appreciation event is one of the many ways we express our gratitude for our top-notch team, and it gives us an opportunity to show other drivers throughout the region why Service One is the best choice for truck driver jobs in Wisconsin,” said Dan Flagstad, Jr., President of Service One Transportation. Guests will have a chance to see some of Service One’s custom-wrapped trucks up close. 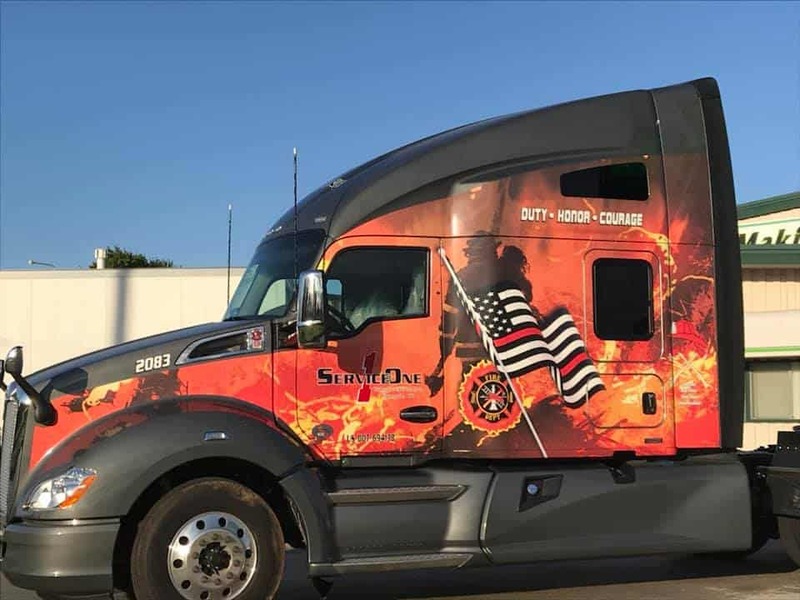 In addition to two military-themed units that pay tribute to notable veterans in the Service One family, the company recently unveiled a new wrap that honors the courage and commitment of firefighters. The custom graphics display the names of several employees who are volunteer firefighters, and the team member who will be driving the truck also served as a volunteer firefighter. Service One currently has openings for Class A CDL company drivers and owner-operators. The Wisconsin trucking company welcomes applicants from its home state and surrounding areas in Illinois, Indiana, Iowa, Michigan and Minnesota. To learn more about Service One Transportation and its available trucking jobs in Wisconsin, visit https://www.serviceonetransportation.com. Headquartered outside Plymouth, Wisconsin, Service One Transportation offers a full range of trucking and logistic services—including truckload, volume less than truckload (LTL) and expedited shipping—throughout the 48 contiguous United States and all Canadian provinces. Dan Flagstad, Sr. founded Service One in 1997 with a single truck; today, Dan Flagstad, Jr. oversees the family-owned and operated business, which now employs more than 50 drivers. The Wisconsin trucking company has earned multiple safety awards—including National Fleet Safety, Highway Safety and Workplace Safety—from the Great West Casualty Company. Service One has a longstanding reputation for unsurpassed customer service and is dedicated to “doing whatever it takes to get the job done right.” The company is also highly regarded among drivers, offering excellent pay, full benefits and a “family-first” culture that ensures a proper balance between work and family time. For more information on Service One Transportation and its trucking, warehousing, logistics and supply chain solutions, visit https://www.serviceonetransportation.com.